We left home just after 09:00 on Monday morning in our Renault hire car and headed for Bagneres de Bigorre. Just past Carcassone, the car emitted a small cough and lost power. My beloved guided it onto the hard shoulder, we leapt out of the car and vaulted the security barrier. I rang Renault Assistance who were unable to assist and advised us to ring the police. I did and they gave me the number for the local constabulary who kindly sent someone to tow us to the nearest Renault garage. All well and good, but the garage advised they would not be able to fix the car that day, possibly the following one. I rang my Renault contact who advised that they were obliged to find us a replacement car and I should ring Renault Assistance. So I did. Finally, after much toing and froing, they found us a Hertz hire car for 4 days. We would however have to return to Carcassone to collect the Renault. This solution did not find favour as we were heading in totally the opposite direction. The Renault garage staff, fearing an imminent and irrevocable schism in the entente cordiale, decided to put us out of our misery and fixed the car in 15 minutes flat. 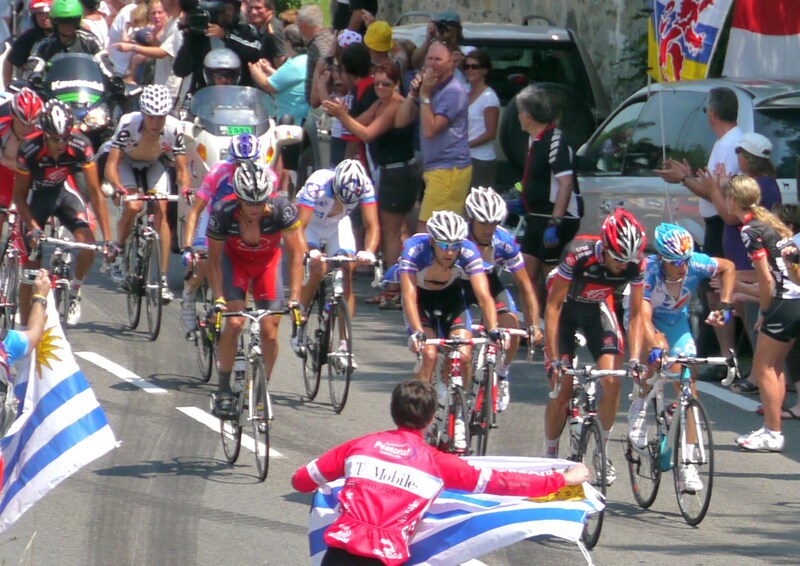 We had planned to go and watch the peloton’s arrival into Bagneres de Luchon. Instead we had to settle for watching it on my beloved’s new mobile. Yet another French win, Tommy Voeckler looking radiant in his tricolour jersey as he crossed the line. Sadly his endeavours were overshadowed by polemics. Should Contador have attacked the yellow jersey when he lost his chain? Andy Schleck’s Dad admitted he’d have taken the same action as Contador: he’d have attacked. No matter, the two have now kissed and made up. Contador leads Schleck by 8 seconds. Tuesday morning, we were up bright and early for our ride up Col d’Aubisque. The roads were literally alive with cyclists in kit of all hues and hailing from the four corners of the earth. We rode companiably, side by side, enjoying the freshness of the air and the magnificent green countryside. It was starting to heat up as we reached the Col du Soulor whose incline starts to quickly ramp up to 12% before settling back down to a comfortable 5-7%. One of the many things I love about the Tour is the ability of anyone and everyone to attend the world’s biggest, best and longest street party. The roads were lined with enthusiastic spectators proclaiming their allegiances and what was surely the world’s biggest concentration of camper vans. While waiting for the real show to put in an appearance, they’re willing to encourage all of us amateurs toiling away up the inclines. I was high fiving small kids as I wend my way upwards. No mean feat given my lack of bike handling skills. Towards the top of the Col, I made an executive decision to stop at the last outpost, before the descent, providing refreshments, toilets and a TV. From here, in the company of a large number of Uruguayans, Americans, Aussies and Danes we watched the slow approach of the peloton. There was much excitement as Lance, having lost so much time on GC, had been allowed to escape and, with his fellow escapees, had over 3 minutes on the yellow jersey. It looked as if the peloton had settled in for a quiet day and was more than happy for Messrs Fedrigo, Casar, Armstrong, Barredo, Cunego, Plaza, Horner, Moreau and Van de Walle to duke it out. Barredo took a flyer off the front but was caught with 1km to go. The two sprinters fought for the line and the win went to Fedrigo, by a nose. The sixth French win and the 2nd consecutive one for Bbox! The yellow jersey group came in over 6 minutes behind, led by Hushovd who gained enough points to regain the green jersey. Otherwise, it was stalemate at the top, leaving Schleck one fewer opportunity to make up lost ground. Thursday should therefore be decisive. Sadly, the weather has changed. It rained heavily overnight and it’s continued to drizzle on and off all day. The Tourmalet is shrouded in mist. Tomorrow, further rain is forecast. But whatever the weather, we’ll be there to see all the action.